The Festival curtain raiser is the £120,000 Grade One William Hill Supreme Novices' Hurdle on Champion Day, Tuesday, March 12. A total of 53 horses go forward for the extended two-mile contest with Timeform rating impressive Betfair Hurdle scorer My Tent Or Yours at least a stone ahead of his peers with a rating of 182p. 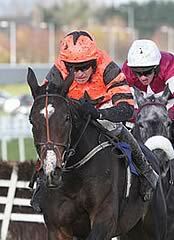 Irish challenger Jezki, also owned by J P McManus, is next best on 168p on the back of two Grade One successes. The £150,000 Grade One Racing Post Arkle Trophy Chase over two miles has 21 entries remaining, headed by Simonsig. The seven-year-old captured last season's Neptune Investment Management Novices' Hurdle at The Festival and has posted two comprehensive victories over fences this term, earning a Timeform rating of 176P. Last season's Stan James Champion Hurdle runner-up Overturn is on 172p after three easy wins, while the Willie Mullins-trained Arvika Ligeonniere is the best of the Irish on 172 after two Grade One successes in the first half of the season. The longest race at The Festival is the John Oaksey National Hunt Chaseover four miles, which opens proceedings on Ladies Day, Wednesday, March 13. A total of 58 horses remain engaged for the £85,000 marathon with Timeform making Grade One winner Back In Focus, trained by Willie Mullins, the top-rated on 167p. Pont Alexandre, also trained by Mullins, heads 74 entries remaining in the £120,000 Grade One Neptune Investment Management Novices' Hurdleover an extended two and a half miles with a Timeform rating of 172p. Course scorer At Fishers Cross, trained by Rebecca Curtis,is next best on 166p. 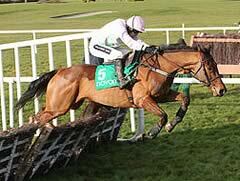 The pair also top Timeform's ratings for the £120,000 Grade One Albert Bartlett Novices' Hurdleover three miles. Often referred to as the novices' Gold Cup, the £150,000 Grade One RSA Chase over an extended three miles sees 31 entries going forward with the David Pipe-trained Dynaste rated six pounds clear of his potential rivals on 175p. The £100,000 Grade Two Jewson Novices' Chase tops the card of day three of The Festival, St Patrick's Thursday, March 14. A total of 40 horses remain with Dynaste and Arvika Ligeonniere heading the ratings on 175, although Timeform believe the former has potential to improve and has been given a 'p'. The £120,000 Grade One JCB Triumph Hurdle is the highlight of the season for four-year-old hurdlers and gets the action underway on Gold Cup Day, Friday, March 15. The two mile and one furlong contest has 47 entries remaining with Rolling Star, who won on Festival Trials Day, top-rated on 164p. The unbeaten Our Conor, for Irish handler Dessie Hughes, is next best on 162p along with the Paul Nicholls-trained Far West.